Above & Below: Constellation is the first Jessica brand polish that I tried, and after seeing it, I was hooked! A deep black-based cranberry shimmer with perfect coverage in 2 coats, convinced me that I had truly been missing out on a top quality line of polish. This is shown with no top coat, and as you can see, it has an ultra-high gloss. Below: Vintage is a conservative, yet classically dainty and beautiful shade that appears as a rose gold in some lighting, and more salmon colored in other lighting. It's a frost with a slight metallic touch, but covered nicely with no streaks. 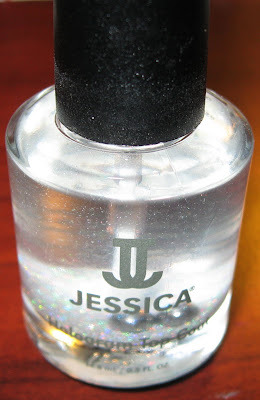 Below: This is one coat of Jessica's Silver Hologram Top Coat. The holographic particles appear to be lit up. The intensity was quite impressive, keeping in mind this is only one coat used over a light shade. I'll be sharing more information and photos on this top coat tomorrow. Above & Below: Bottle pictures of the Silver Hologram Top Coat, before and after shaking it. A new year, a new obsession: Jessica Custom Nail Colour. I've been wanting to try this brand for quite some time, and I finally got around to trying out some of the shades I ordered a month or two ago from Hello-Gorgeous.net. I used a coupon code which may still work for $5.00 off $50.00 (hg5off), and they also have free shipping over $49.00 and flat rate shipping on all orders under $49.00 for $4.95. The Jessica polishes are priced at $4.95 on this site, and I have also ordered Lippmann polishes from them ($16.00) with no problems. The Jessica brand offers a wide range of colors and finishes, and of the two I've tried so far, the application was perfect. The polish applied well in 2 coats and dried quickly to a high shine. The formula itself seemed to flow very evenly, giving me little to no problem with streaking, even on the first coat. 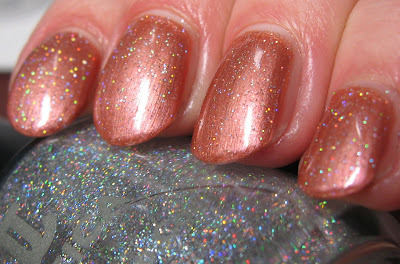 I have several more shades to share with you, one of them being their Silver Hologram Top Coat, shown minimally above. I've played with it a bit more after taking these photos, and I've got to tell you, this may be the nicest hologram top coat I've ever used. More on that in the next post! wow i love them both..
That shimmery topping is gorgeous and soo delicate!! I don't have any Jessica...they use it in a lot of spa places that offer manicures here - I've never tried it myself though. I love Constellation - very classic and striking. Constellation is just gorgeous. I can't believe that's without a topcoat! I've never tried Jessica polishes before, but now I definitely plan to. Are Jessica polishes available anywhere in the US anymore? I used to buy them at Eckerd Drug, and also Target. 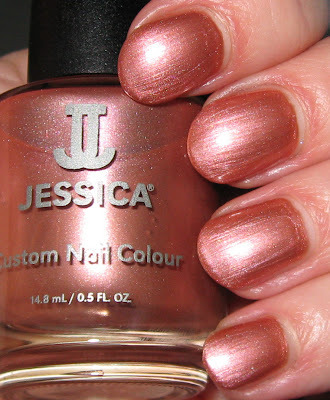 I want Jessica polishes! Sigh. This one is really pretty! Ooo, those look so pretty! I love Jessica. I also have both the gold and silver hologram top coats. They are awesome! I also tried Out the Door's silver but Jessica's is sooooo much better. The look of the hologram glitter is great with the Jessica versions. Beautiful manicures. The first is really such a lovely shade. I have some Jessica polishes. I haven't tried them yet. That is some fantastic holo topcoat. Very pretty. i had no idea about this brand, but i might seriously have to give it a try! the look so rich and pretty! Art of Nail~happy you like them! Happy New Year to you! AmusedPolish~I wondered about the similarities, so I did a comparison to other holo top coats in today's post. Evil Angel~I am in love with that one. So deep and richly hued. Tali~I like it for a simple look with a little punch and it really steps itself up on a darker shade. itskarmababy~I just ordered kind of blindly, but afterwards, I looked at the charts and they are not very accurate, I agree! Helen~it seems to be a very good quality polish. I totally agree with you about Constellation, it's stunning. Whitney G~isn't that beautiful? They're all extremely shiny, but this one is something extra-special! Caroline~I have not seen them other than online. A friend of mine said she's found them in random beauty supply stores, and anon. above mentions that also. adorepink~I'm so happy I finally tried these. Love them! gildedangel~glad you like them! I need more now! 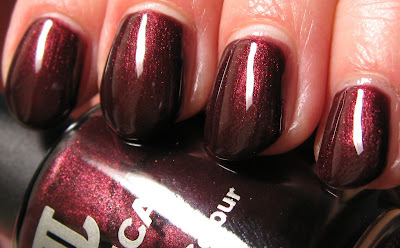 Anonymous~I know, it really is a superior hologram top coat. Thanks for the info on where to find them. Guess I should start hunting around some beauty supply shops too. Lucy~try them out and let me know what you think. I'm loving them. Tiffany~they have such a nice formula and all of the shades I got seem very nice, but some, like Constellation, are over the top gorgeous!